Northampton, with it's rich and distinguished history, is centrally located in the heart of England and dates back before the Iron Age. The sites of many ancient settlements and Roman roads can be found around the town. Northampton began life as a Saxon village called "Hamm tun", which means the village by the well-watered meadow. In the 8th Century the Anglo-Saxon Chronicle refers to events when King Edward recaptured the town from the Danes in AD913. The Domesday Book shows Northampton as consisting of 300 houses in 1086. The oldest buildings in Northampton and, apart from some castles, probably the country are Delapre Abbey, St. Johns Chapel Hospital and the Church of the Holy Sepulchre. The first Earl of Northampton, Simon de Senlis, built a fine Norman Castle which, being strategically located in the centre of England, became very popular and important to both royalty and heads of state and regularly hosted Parliament. It was the scene of many sieges and was chosen for the trial of Thomas a Becket, Archbishop of Canterbury in 1164. Northampton was also famous for being the most educated town in Europe, holding in its Monastries and Nunnerys some of the most literate and educated people in the world. From 10th century to the reign of Henry III, the town had its own mint, which proved how important it was considered to be. It was in the 12th century, while Northampton was amongst the richest and most important towns in England, that Richard I granted the town its first charter. In 1264 there was a rebellion against the King and a royalist army captured Northampton, which soon afterwards went into decline. By the 14th century there were reports that many parts of the town were in ruins. For many centuries, Northampton's staple industry was the manufacture of shoes, and records show that the town made 4000 shoes and 600 boots for the army in 1642, and further huge numbers for Oliver Cromwell's army in 1648. Before this however, the main industry was Wool, which was woven and dyed in the town. One of the many old buildings still standing today is Hazelrigg House, where rumour has it, Cromwell slept the night before the great battle at Naseby in 1645. 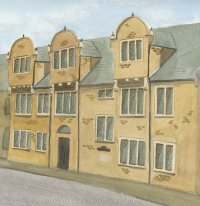 Hazelrigg House, built in the Elizabethan period, is one of the few buildings to escape the Great Fire of 1675, which started in St.Marys Street on September 20th. Being popular with Royalty, privileges were granted to the citizens of Northampton which accumulated as the centuries passed. One such privilege concerned dogs. It was law then that all dogs paws must be clipped to prevent them from tearing to shreds the Monarchs game. The ordinary people of Northampton were allowed to leave their dogs paws unclipped in defiance of that law. The town turned against the monarch, Charles I, in 1642 and sided with Cromwell. Their eventual reward was an unpaid bill for the thousands of boots they had made for his army. The castle was not destroyed in the Great Fire since it had already been pulled down by Charles II. Charles II was exiled to France following the execution of Charles I. When he returned from exile he decided to reduce the status and power of the town as punishment for its disloyalty during the English Civil War. He did this in 1660 by tearing down the castle and its walls. The Market Square is reputedly the largest fully enclosed open air market in the country. Surrounded on all four sides by a wealth of historic buildings that retain much of their old world charm despite being converted to modern day shops. 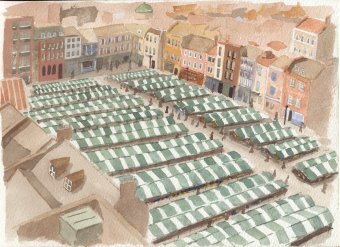 The Market Square was first used by the Romans to distribute food, drink and instructions to soldiers from Central England. The Square dates back to 1235 when the selling of goods in the All Saints churchyard was stopped by Henry III. Up to the opening of a purpose built Cattle Market in 1873, livestock as well as usual provisions were sold. It is a fact that there are tunnels beneath the Market Square and it is also known that some of them link to government buildings such as The Guildhall. There is much speculation about the original purposes of these tunnels but 'secret escape routes' is probably the most favoured. Until relatively recently, the square has always boasted a fine monument in its centre, the last being a superb Victorian Fountain, erected in 1863, and sadly removed in 1962 because of persistent vandalism. By 1831 a third of all the men living in Northampton were shoemakers. Prior to the 1850s they were all 'home-workers', making shoes in their cellars or garden sheds. Commercial Shoe Manufacturers were really only warehouses in which finished shoes were received, inspected, packed and despatched. 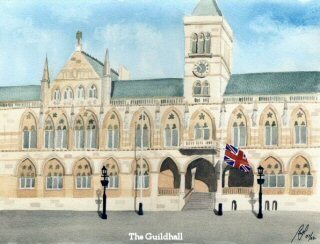 The Guildhall is Northampton's most prestigious building, and is a splendid example of Victorian Gothic architecture. Built in 1864 by the famous architect Edward Godwin, it is still possible to visit the Great Hall, Council Chambers, the Mayor's Parlour and the old prison cells. The county of Northamptonshire is famously know as "The Rose of the Shires", but is also referred to as the county of Spires and Squires. Within the county are very many beautifully preserved churches, like this one in the village of Earls Barton that has a Saxon Tower dating back to 970AD. What is particularly interesting is that, along with the Saxon Tower, the church boasts a Norman Door, 15th century Screen, and 17th century Tower Clock. 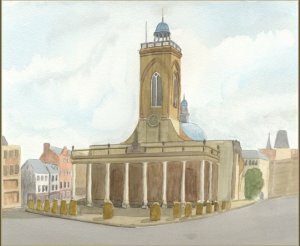 In Northampton town itself stands the imposing 17th century Church of All Saints, and the Church of the Holy Sepulchre, the largest and best preserved Norman round church in the country. The "Spires" refer to the many churches, and obviously the "Squires" refer to the many Lords and Land owners who have built magnificent country mansions. One such mansion that has found world-wide fame is Althorp House, the home of Earl Spencer, the brother of Princess Diana. Set in the quiet tranquillity of the English countryside, Diana now rests on a small island in the centre of a lake within sight of the home where she spent her childhood. 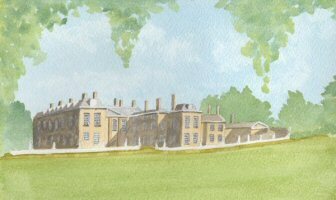 Althorp House has been home to the Spencer family for 500 years. In 1508 Sir John Spencer acquired a 300-acre estate and his grandson (Also Sir John) had made it the principal Spencer family home by the time he died in 1586. It houses a most impressive collection of masterpieces by many of the worlds finest artists including works by Rubens, Van Dyck, Reynolds and Gains-borough, to name just a few. "No less than 38 barges, laden with coals and other merchandise and adorned with flags and streamers came up with the greatest ease to South Bridge. 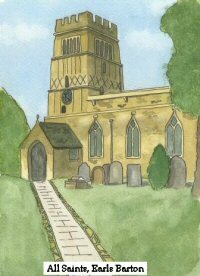 The town of Northampton rejoiced with the firing of cannons, bonfires and ringing of church bells". 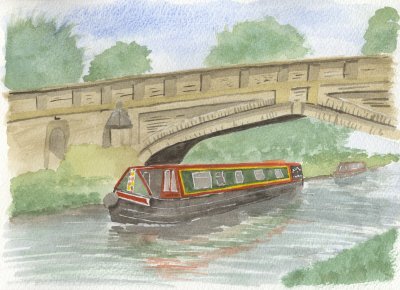 About 3 miles south of Northampton, the canal passes through a tunnel between the villages of Blisworth and Stoke Bruerne. The tunnel was opened in 1805, and is the second longest still open to navigation. Bargees used to power their craft through the tunnel by laying on their backs and walking their feet along the tunnel roof. At Stoke Bruerne there are seven locks, and one of the countries finest waterways museums. Silverstone Racing Circuit Click here to read about the origins of this world famous racing circuit. Produced by John W Johnston, Northampton, England.